On a rare day when I have this time, the temptation is there to fill it right up with more activity, more going and more doing. Most days, I don’t have this luxury, of course. It’s the mad morning scramble of toothbrushes, hair brushes, ribbons, bows, socks, shoes, lunches and backpacks to send children out to the bus stop. Then, zoom into the day with the baby and the errands or meetings or Bible studies or appointments or whatever busyness has etched itself onto the schedule. But this day. This one day. After I watch my girls step onto that school bus, I return to my home and breathe in and out this uncertain freedom. I don’t have to run out the door. I don’t have to meet an external agenda or deadline until the afternoon. Rush through my home, stuffing laundry into the washing machine and another load in the dryer? Frantically move cereal bowls from sink to dishwasher and then grab the broom (maybe the mop if I’m inspired). Respond to messages. Catch up on the to-do list. Fill out the forms. So it goes, me filling up this one little space of time with too much, cramming in activity and sitting on the lid in hopes it will fit. My tea, poured hot this morning turns cold. My morning devotions, rushed through just to be done, leave me unfilled, uninspired, unopened to what God wants to say. Too busy…too busy…just always too busy. But today I consider Joshua. Moses met with God face-to-face in a tent. A pillar of cloud covered the entrance while the Israelites looked on from the flaps of their own tent dwellings, bowing in worship in the doorways. When Moses finished talking with God, he returned to the camp to share the message with others. “his assistant, the young man Joshua son of Nun, would not leave the inside of the tent” (Exodus 33:11 HCSB). He wouldn’t budge from the glory and the presence, lingering there stubbornly while others moved along. 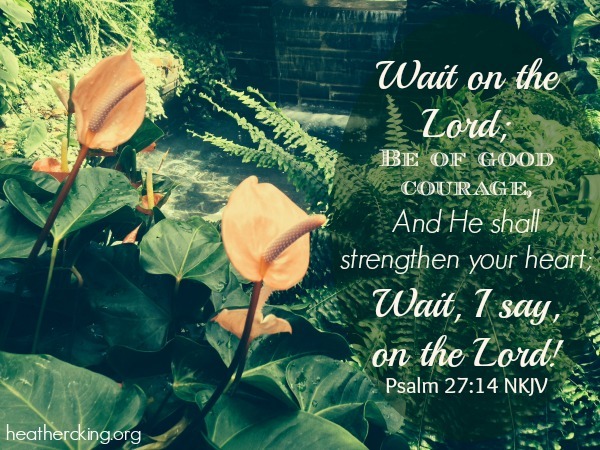 What if I chose to linger here….chose to be Joshua refusing to leave the tent as long as God’s glory electrified the air….chose for this one day to be Mary at the feet of Jesus rather than Martha slamming pots in the kitchen? Because serving perpetually means serving empty and that means dying of spiritual starvation and dehydration. We need the Mary moments so we can re-enter the kitchen as Martha and care for others cheerfully and ably until we have that opportunity once again to lay down the dish towel and sit at Jesus’ feet. It’s not practical, of course. That crowd of more than 5000 who sat on the hillside listening to Jesus hour upon hour should have been watching the clock. They should have known what time it was and how long they had to travel back for food. They should have abandoned the sermon and packed up their blankets and lawn chairs at a reasonable time so they could eat dinner at a reasonable hour. Yet, Jesus rewarded their time in His presence. Had they left early, they would have missed the miracle. In order to witness God’s glory, they had to wait, they had to sit patiently and linger there until they received. 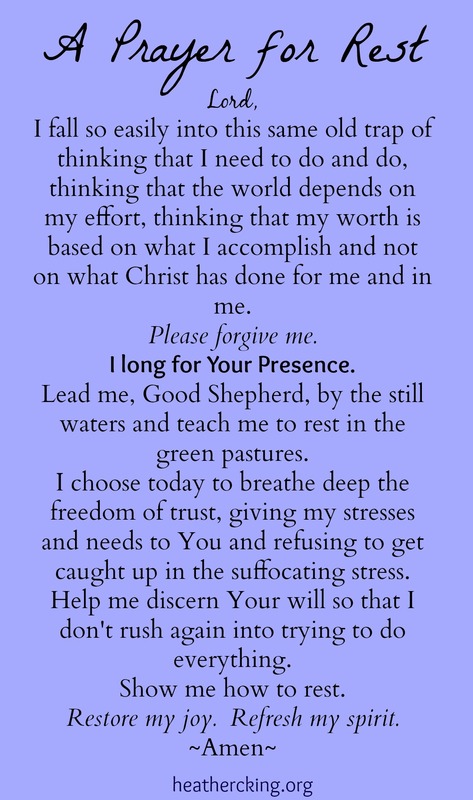 This is what I consider as I spend this month Sabbath-Keeping during my year-long pursuit of the presence of Christ. For me, it’s just this one day a week to take my morning slow before the afternoon and evening wave of stress and busyness crashes down again. 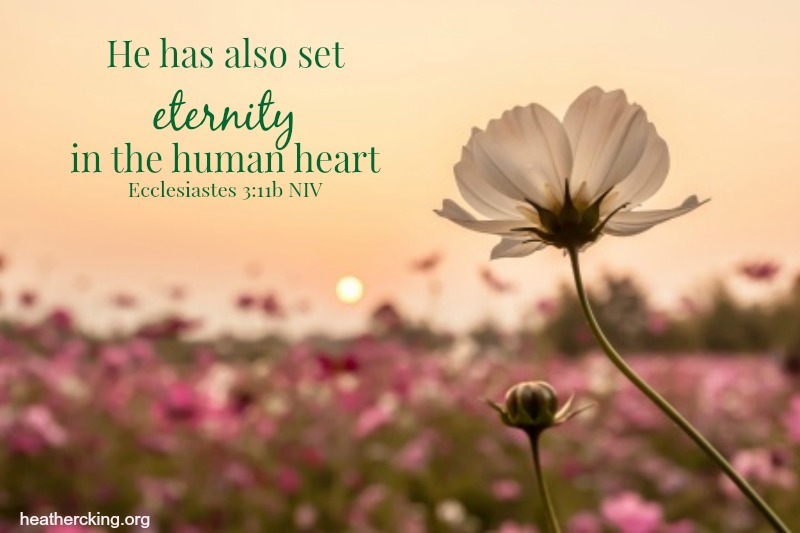 For you, it may be a morning, a day….even a season of sitting and waiting on that hillside so you can see His glory, or a season at Jesus’ feet instead of in the kitchen, or a season of lingering in the tent. Whatever the length of the wait and the stillness, it’s a discipline to rest rather than rush. 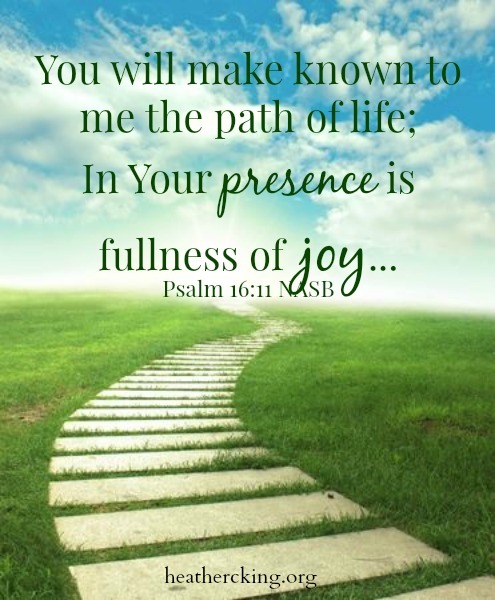 When we remain there, though, insistent on lingering where His presence is, we see His glory displayed and He fills us up with the sustenance of His presence and His Word. But only when we wait until He says it’s time to move on. If I sit down for 15 minutes, will there be a cosmic meltdown? These two weeks are going to be crazy busy. You will be tired. And that means you’ll probably be grumpy. When we get this tired, the ugly comes out. So, for the next two weeks we have to show each other extra grace and patience and we need to rest whenever we can…. As soon as my speech ended, they continued bickering over prime-seating in the minivan and when we got home, they fought over prime seating during nighttime prayers and who knows what else. I made the speech again. I do this for my kids: I prepare their hearts and minds for busy seasons. I remind them about grace. I ease the burden some, removing some expectations, allowing them to slack off in some areas so they can focus on what’s important right now. I give them this breathing room. But I don’t often do it for myself. In my 12-month pursuit of the presence of Christ, I’ve reached November—the month when I’ll study and focus on the Sabbath. And interestingly enough, I’m entrenched in two of the busiest weeks I’ve had since school ended last year. Isn’t God funny that way? I’m slowly reading Priscilla Shirer’s study: Breathe: Making Room for Sabbath and she teaches me about building Sabbath Margin into my life. How to leave space for God to work. How busyness can crowd out His will. How there’s only so much time and if I’ve packed in the activity too tightly, I’ll run out of room to breathe. But rest takes great effort for me. It’s a spiritual discipline that I struggle with. I’m better at keeping up with my yearly Bible reading plan and juggling multiple Bible studies and devotionals, memorizing Scripture, praying, and journaling than I am about obeying this Biblical command: Rest. I’m physically incapable of napping. Instead of sleeping, I lie awake thinking about all the things I should be doing instead of sleeping. By the time I finally give up and throw back the covers in defeat, I’m frantic about the wasted time and move faster through my to-do list to make up for it. I feel guilty for leisure, embarrassed by free time, and apologetic for fun. Taking a break feels like laziness. There’s something else at work here beyond just an addiction to adrenaline. Oh, how I hate for it to be true, and yet digging down deeply enough reveals its ugly presence—-pride. Truly, it feels good to be needed. It feels important to be so busy. When I run around in a breathless pace, doing, doing, doing all the time, I act as if the world depends on me to function, as if me sitting down for 15 minutes would create cosmic meltdown. And that’s why God, from the very first week of creation, instituted a Sabbath rest. It wasn’t for His benefit, as if the Almighty God who created a sun, moon, and planet with the power of His words grew weary and needed to sleep. No, the Sabbath was not for God. Instead, Jesus “said to them, ‘The Sabbath was made for man” (Mark 2:27). It’s a reminder that the universe can exist without our involvement and labor. It’s a re-ordering of our perspective, so that we remember it is God who is essential and not us. So often, we forget that our jobs, our families, our ministries, our relationships, our everything depend not on our ability, but on God’s power. We stress about meetings because we think everything relies on how well we present ourselves. We plot out conversations because we think the outcome depends on the words we choose. We think. We plan. We do. We fix. We busy ourselves. We worry. We analyze. We lose sleep. God knows the pride that burrows itself into our hearts; the tentacles it wraps around us as we seek fulfillment in accomplishments, in tasks completed, in people depending on us. Sabbath isn’t about Pharisaical hypocrisy and legalism. It’s not about do’s and don’ts. And Rest is about humbly stepping aside. It’s about the placing and continual re-placing of God in control of our lives. So, I’m going to take some rest time. At least for next week, I’ll stay quiet on the blog….spending time reading, creating, being with God, being with my family, instead of writing and posting on my regular days. I’ll be back the following week and I’ll announce the winners of the big giveaway, so keep entering!! And I’ll hopefully remind my soul that it’s all about Him, always Him, never me. Eat Cereal and Go to Disney? My daughter announced at the breakfast table that if we wanted to go to Disney World we all needed to eat a particular cereal. I peek over my shoulder to see what she found: a contest on the back of the cereal box. One grand prize winner. Yada yada yada. Not exactly the reality she was trying to spin for her siblings: Eat this box of cereal = a free trip to Disney for the family. (A) We do not own a dog. (B) We have never been to Disney. I promise her that I’ve entered plenty of Free Trip to Disney contests before yet I’ve still never been there. It’s because I never win anything. But as I try to protect my dear daughter from the inevitable disappointment of finding that eating this particular cereal did not by default mean we’d be standing outside Cinderella’s castle next summer, I remember my prize from last week. We made our annual family trek to the pumpkin patch. When I paid to get in, the nice lady at the farm handed me a jar of homemade pumpkin butter. She said the first 25 families that visited the farm that day were receiving a gift. In fact, she didn’t have any more jars there on the shelf behind her, so I’m pretty sure we were number 25, making this all the more reason to celebrate. Oh, we love to complicate things don’t we? I think how difficult I can make this sometimes, asking what I need to do to win God’s affection or attention and earn His favor. I can know it in my head. It’s grace. It’s mercy. He doesn’t need me to perform elaborate rituals or scream and shout for the prize of His divine attention. I think surely I must have let Him down and disappointed Him or missed a step and messed things up along the way. Maybe He’d have blessed me, but I did something wrong and now He can’t. Or I made a wrong decision somewhere and stumbled out of His perfect plan for me. It makes it seem so fickle. Like I’m playing some guessing game and the prize for guessing correctly is His favor and affection. But one wrong answer and I’m out. I read about the resurrection appearance of Jesus, how He appeared first to Mary Magdaelene and then to the other women who had visited the tomb that morning. Why did Jesus appear first to two women? The answer is so simple. They were the ones who showed up first. We won’t always get it right. Sometimes just ‘showing up’ begins with that first humble act of repentance, of praying in earnest that the Holy Spirit do His work, search our hearts, purify and refine. But showing up also means just coming as we are. Not trying to figure out some complicated formula in order to gain admittance to see Jesus. We don’t have to delay coming to Him because we’re not ready yet or worry that He’ll send us back because we’re so unworthy. She holds the marshmallow too close to the blue flame and it ignites. Then she blows with one puff of her cheeks and giggles at the sight of her charred and blackened puff of sugar on a stick. We’ve huddled around the tiny Sterno burner set in the middle of our kitchen table with long forks poked through marshmallows to roast them and make S’mores, a favorite treat. On a night when we have time, when we miraculously aren’t scarfing down dinner and rushing into the car for an evening of dance classes followed by church activities, we like to roast the marshmallows over the flame. Not living on a campground, however, we use the Sterno instead–filled with fuel that burns blue and purple when lit by my match. When we’ve each charred our marshmallow and smashed it down on the milk chocolate with the two graham crackers, I smother the flame with the lid, blocking the fire from the necessary oxygen for burning and thriving. Just sputters right out, so simply, so quickly, so inevitably… suffocation through lack of breath. The running, the pace, the schedule. The remembering: appointments, agenda books, reading logs, library books, dance schedules, Bible verses, lunches, emails, jackets, reaching out to friends, counseling my children. Trying not to forget the Holy Spirit words stuck to my fridge, my bathroom mirror, my car: Love is patient. It’s beauty day in and day out, watching these children grow, loving on them, learning from them. This is the blessing that makes me pause and whisper thanks to God. It’s beauty to minister, beauty to serve, beauty to love others with God’s love and to give generously to them just as He has given generous heaps of mercy and grace to me. Beauty takes sacrifice, though, it takes giving and giving and giving and sometimes I forget. I forget that running breathless too long suffocates, cutting off the oxygen we need to survive. How often we do this, too: Fueling our flames with our own resources, running our own self-provided fuel. The prophet Zechariah teaches me this truth. He has a vision—-“a solid gold lampstand with a bowl at the top and seven lamps on it, with seven channels to the lamps. Also there are two olive trees by it, one on the right of the bowl and the other on its left” (Zechariah 4:1-6). I rush past the words in my Bible, treating them like just another mysterious prophetic vision, obscure, and disconnected from my life. 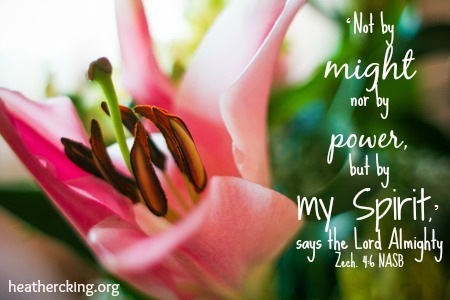 “This is the word of the Lord to Zerubbabel: ‘Not by might nor by power, but by my Spirit,’ says the Lord Almighty (Zechariah 4:6). “The prophet saw two olive trees that supplied oil to a bowl that fed seven lamps on a golden lampstand. As we think about the reality behind this symbolism, we can be encouraged. You and I are not the source of light that enlightens the world. We can only receive the oil of the Holy Spirit that fuels the living flame He produces. If we burn steadily through the long, dark hours, it is because we have learned to yield our lives to the Spirit’s unlimited supply of power and strength. This comes only through continual fellowship with Jesus our Savior (p. 1018). It was catchy and cute then. It’s breath in my lungs now. Do you feel the grace here? You and I don’t have to be enough, don’t have to keep ourselves going, keep up the pace, keep things together….we aren’t the source and the world doesn’t depend on us or rest all heavy and cumbersome on our wimpy shoulders. We seek the oil of His Spirit poured into us and that is our Source, our Strength, our fuel that keeps on going and doesn’t run dry or sputter out or suffocate and die. Not by my might (I’m so weak and helpless really). Not by power (I tire easily and can’t keep all this together). Oh yes, Lord, fill us anew with Your Spirit. Am I Asking Jesus to Leave? She said he was afraid. A small team from our church took VBS on the go this year, sharing the lessons, songs and games with kids in the community. One of the ladies shared with us this past Sunday what that mission to area children was like. She tells how on the last day, those little ones gathered around the teacher for the Bible story about Paul. He was such a Bad Guy, she told them. She told all about his past, all those mean things he did to Christians. This little boy, cuddled next to another leader, winced and sucked in his breath every single time she said it. He’d only ever heard those words as cursing in anger and bursts of outrage in his home. Salvation is found in no one else, for there is no other name under heaven given to mankind by which we must be saved (Acts 4:12 NIV). We sit in that comfy sanctuary in the middle of a tiny town in rural Virginia and our hearts break because missions starts right here. There are children who don’t even know what a Bible is or who God is or that the name of Jesus isn’t a cuss word…and they live right here. Then all the people of the region of the Gerasenes asked Jesus to leave them, because they were overcome with fear. So he got into the boat and left (Luke 8:37 NIV). The people were afraid of Jesus at work. They weren’t embracing the healing he offered and not the salvation either. They sent Him away and with it they refused all hope of rescue. All because they were afraid. Maybe they didn’t wince at the sound of His name, but they feared Jesus’ presence. Were they afraid of His power? Were they afraid of shaking things up? Afraid of what salvation might cost? Fearful of what they might lose if they followed Him? When the people saw the thunder and lightning and heard the trumpet and saw the mountain in smoke, they trembled with fear. They stayed at a distance and said to Moses, “Speak to us yourself and we will listen. But do not have God speak to us or we will die.”…The people remained at a distance, while Moses approached the thick darkness where God was (Exodus 20:18-19, 21 NIV). They trembled there at the mountain, slinking back in fear, remaining at a distance even when God invited them to come close. This holy fear of God has its place, the reminder of His greatness and mighty power and how small we are indeed. He is holy. I am not. We need the reawakening of awe. Are we too afraid that He’ll disrupt our lives? Or that drawing close will cost us and it will just be too much to pay? 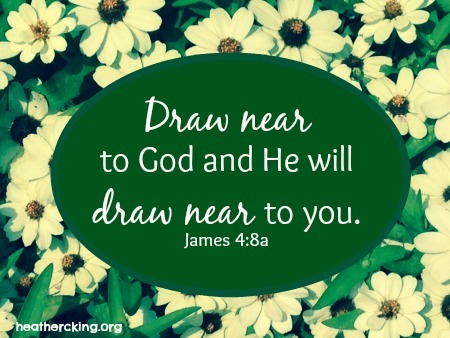 Do we stand right there at the base of His presence and choose the safety of distance instead? Maybe we know just enough…certainly more than a scared little boy listening to a lesson at Vacation at Bible School: yes, God loves us….yes, Jesus is our Savior. Maybe it’s just ‘blah, blah, blah’…just so many words. Yet, maybe we shut Him out. Maybe we avoid the conviction of Scripture or the passion of all-in of worship. Maybe we want to sing “safe” songs on Sunday morning, hear “safe” messages, leave the Bible reading up to someone else, avoid the accountability of church or the nudge of the Holy Spirit to lay it all down in surrender. 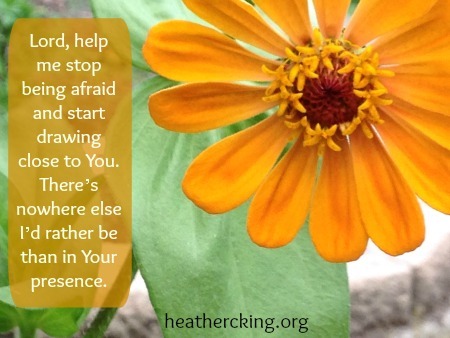 Lord, help me stop being afraid and start drawing close to You. There’s nowhere else I’d rather be than in Your presence.